Did you know? the Demand for AI talents has been increased by almost 119% in the last 2 years!? Employers are hunting for talented AI professionals! PwC predicts that Artificial Intelligence could add $15.7 trillion to the global economy by 2030. If you don’t want to read then watch this video instead to understand the prerequisites for AI and where to learn AI. So what exactly is Artificial Intelligence or otherwise known as AI? In simple terms Artificial Intelligence means intelligence demonstrated by machines, naturally as how a human display! For example, A car can be driven using Artificial Intelligence without a Human driver!! Wow…! that’s Impressive! So now comes the question of how does machine able to do that? Let me tell you, AI is a massive area of study, you cannot directly jump into AI and become an AI professional overnight. If you want to be a successful AI professional, You need to spend lots of Time in learning and developing AI models. There is no time period can be defined but at least 6 months to 1 year full time commitment is required based on your existing knowledge. 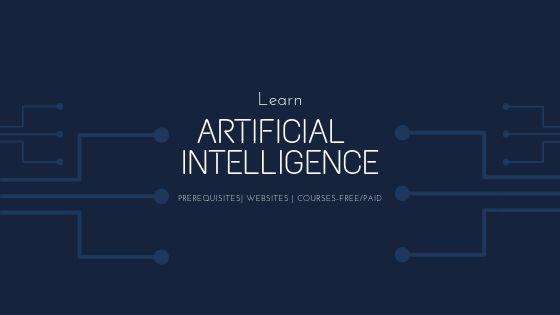 If you just want to understand what AI is all about and how does it work, then there are many courses and materials available where you can Learn Artificial Intelligence Online and offline! You need to have at least High School level Mathematics understanding to take up your first step towards AI. If you are someone who hates Mathematics, Algorithms, Statistics, Data & Analytics etc., then I’m sorry to say, AI might not be your cup of tea! You need to know at least one programming language, preferably any one of the following top 5 programming languages used in Artificial Intelligence. My personal choice is Python due to its simplicity to learn and less development time. These are the very basic 2 Prerequisites for your Artificial Intelligence Learning. Once you have these knowledge then you need to approach AI in a very systematic way. Your journey to Artificial Intelligence becomes easier if you know Deep Learning and Machine Learning. There are many Good Courses available on all these areas. Below are some of my favorite places to learn courses online and they have really good courses on AI, Machine Learning and Deep Learning as well! Udemy has lots of courses on all these 3 areas, detailed and easy to follow. Some courses really walk you through the basics of Deep Learning, Machine Learning and AI with practical examples like building your own Self Driving Car, and, making AI models play Doom, Breakout and similar games. You need to spend some time to go through the course contents, rating & reviews before enrolling. Not all courses are Free in Udemy but the course fee is very less when compared to other online platforms. As of making this video I have not found any course specific to Artificial Intelligence in Coursera, however, there is a great course on Machine Learning from Stanford University by Andrew Ng. I strongly suggest you to take this course. Full Course is Free but if you need Certificate then you need to select the ‘Purchase Course’ while Enrolling.
. I would say it covers everything related to Artificial Intelligence, from basics to master. If you are serious about AI then its a great investment. Artificial Intelligence Engineer Master Program is a Paid course, however, many modules of the course are Free, just have a check on their detailed Learning Path. Microsoft has a wonderful course on Artificial Intelligence: Microsoft Professional Program for Artificial Intelligence which covers all the essentials as well. Like starting from Introduction to AI, Mathematics for AI, Data and Analytics, Machine Learning, Deep Learning, Reinforcement Learning and so on. You might consider taking this course considering the coverage. Full course is Free and if you want the certificate only then you need to Pay. edX also has a lots of AI courses from various universities, even the above-mentioned AI course from Microsoft is also available in edX. Like above, the course is Free and if you want the certificate only then you need to Pay. These are only a few of the platforms where you can learn AI but not the only sources available, there may be many other websites and universities where you can Learn Artificial Intelligence Online and offline. Please let me know in the comments section below if you come across any such great courses on AI.